Last month I promised I would post more recipes using Truvia Baking Blend. 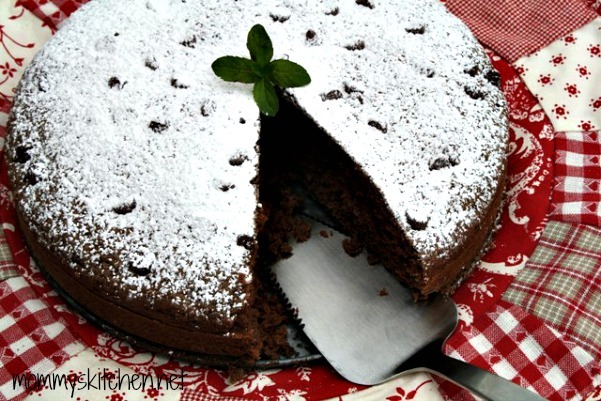 A promise is a promise, so today I'm sharing a simple Lightened - Up Chocolate Zucchini Cake. Before we know it our gardens will be overflowing those green beauties. I don't know about you, but zucchini is the one vegetable that grows perfectly in my summer garden. If zucchini isn't on your list to plant this year, it should be. I overheard our produce guy at my grocery store say that there will be a shortage this year. No problem because zucchini is easily grown in a home garden. If you don't have a space for a garden then buy some while you can and freeze it. 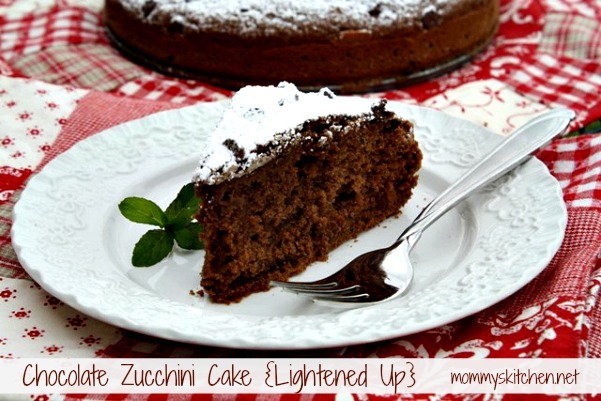 Store bought or garden grown you will need a couple zucchini to make this delicious cake!!! 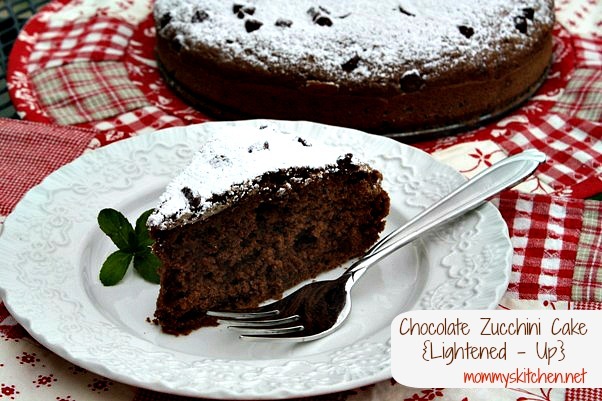 Trust me this cake is light, chocolaty and packed full zucchini goodness. I found this recipe on Saveur and interchanged a few of the ingredients to lighten it up a bit. As soon as I saw this cake recipe I immediately thought about using Truvia Baking Blend. If you're not familiar with Truvia's Baking Blend, it's a sugar alternative that provides a sugar-like taste and texture in many baked goods. Truvia Baking Blend allows you to keep all that goodness while letting go of 75% of the calories from sugar. Truvia's Baking Blend adds moisture, and texture just like regular sugar. When using Truvia Baking Blend there isn't any complicated conversions to remember. Just use half as much Truvia Baking Blend as you would sugar. A few other lightened up ingredient I used is low fat buttermilk, coconut oil and an egg substitute. I thought this cake turned out fabulous and it was the perfect size. Enjoy!! If using grated zucchini squeeze out as much water as possible using a cheesecloth. Transfer zucchini to a bowl and set aside. Preheat oven to 325º. Butter a deep 9" cake pan or spring form pan with 1 tablespoon of the butter. Sift flour, cocoa, baking soda, and salt together into a mixing bowl and set aside. Beat together remaining 8 tablespoons butter and Truvia Baking Blend in a large bowl with an electric mixer on medium speed until fluffy, 3-4 minutes. Add coconut oil, beating well. Beat in eggs one at a time, add vanilla, reduce speed to low, and beat in flour mixture and buttermilk in alternate batches. Stir in reserved zucchini. Pour batter into prepared pan and sprinkle with chocolate chips. Bake until toothpick inserted in center comes out clean, about 45 minutes - 1 hour. Remove from oven and set aside to cool completely. Invert onto a plate and dust with powdered sugar. Here are a few step by step photos. Everything is mixed in one bowl and one baking pan is used, so it doesn't get any easier. Want to learn more about using Truvia Baking Blend? For more information and tips on Truvia visit them on-line at www.truvia.com/baking. You can also connect with them on Pinterest, Facebook, Twitter. This is a sponsored post. I'm part of the "Truvia Honestly Sweet Baking Bloggers". I was compensated for my time and efforts in creating this post. As always, the opinions stated above are 100% entirely my own. That looks wonderful....love all the substitutions. Thanks for sharing. I would love to see nutritional information! I am diabetic and really need the grams for carbs. Any other info would be greatly appreciated! Thanks for some great recipes. I couldn't imagine we could put zucchini and chocolate together :) My sister would love it ! Looks great and in a couple of months we will have more zucchini than we handle. I have made zucchini brownies and they are great. Even though I'm a Lifetime Weight Watcher member we eat sugar, no substitutions. So how much sugar would I use, is there a formula to figure this out. Sheila, If using regular sugar it would be 1 1/2 cups. With Truvia baking blend it is half the amount of regular sugar. Thank you SOOOOO much for the nutritional calculator website. It will be VERY helpful to m with other recipes too. I don't think I would make this again. The cake was so dry. Is it supposed to be that way?